Were you always getting into trouble when you were younger trying to cut your own hair or the hair of your brother or sister? Were you the go-to person for doing the hair for friends and family for special occasions? Barbers are a special breed. They are creative, personable, have an interest in the latest hair styling trends and, most importantly, they have a love, passion and dedication to the haircutting profession. A professional barber should be knowledgeable about cutting hair and anything related to their profession. He or she will use their knowledge to make wise judgements when cutting their customers’ hair. They won’t automatically comply with the customer’s request. If a customer requests a bad haircut, a professional barber will not be afraid to refuse doing the cut. They will instead offer an alternative haircut that will look the best on the individual customer. In many cases, a professional barber will use their knowledge and professional judgement on every haircut and deliver the customer’s desired haircut if it is in the customer’s best interest. A professional barber will love, enjoy and take pride in their work and profession. They will have an unwavering set of ethics they abide by and hold themselves and their work up to high standards. An example of a barber’s dedication and respect for the profession is the refusal to barter their services, doing “favor” haircuts at home rather than at the salon. Many professional barbers had a fascination with early on in their childhood. They enjoyed experimenting with doll hair, their own hair and the hair of their siblings. They enjoyed styling the hair of friends and family members for special events such as proms and weddings. Barbers and those in the cosmetic and skincare industries are characterized by their friendliness. They enjoy listening to their customers and getting to personally know their customers through conversation. Professional barbers love being around people and serving them through quality haircuts that make them look and feel good. Professional barbers are hard-working, persevering and dedicated. They are driven to not only succeed, but to also express and exercise their own unique haircutting style. If they can’t freely express their unique style, they break out on their own and be their own boss. Many have the work ethic, dedication and drive to become successful business owners. Barbering is a perfect fit for those who are looking for a rewarding, satisfying career that centers around being creative. Professional barbers are always current on the latest trends and are eager to try something new. Barbers take pride in the ability to freely exercise their creativity. They are always looking for new possibilities. You won’t find any cheap haircutting tools in a quality salon. A professional barber will take their profession and the service to customers seriously. They won’t compromise either by using haircutting equipment you can buy at Wal-Mart. Instead, they will spend more on better quality equipment. Similarly, the barber will have a thorough knowledge of each piece of equipment. You should never hear a barber ask a customer “what number do you want?” for a razor or use plastic attachments that anyone can learn to use. As you already know, cutting hair is messy. Touching people’s head and scalp can also be unpleasant. The haircutting profession, along with other professions that routinely are touching customers and are in close contact with them, has the risk of easily spreading germs from one customer to another and from customer to barber. Professional barbers, are therefore clean and strive to constantly have a safe and sanitary salon, even going above and beyond the state sanitation laws and regulations. They will disinfect all their tools after each use, frequently wash their hands, and regularly change their linens. 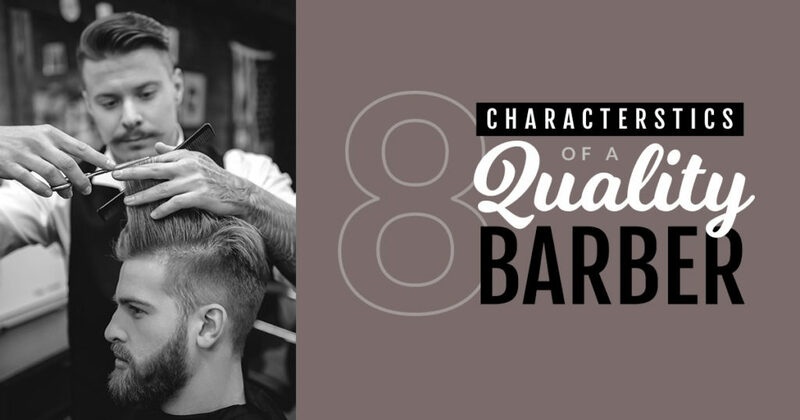 If you share these eight characteristics, chances are you’re on your way to becoming a successful barber. The first step in launching your professional barber career is to go to barbering school. Taylor Andrews Academy of Hair Design is nationally-recognized and has a robust track record of giving their students the right education and experience to help them get into some of the top international. Many of our graduates have gone on to establish their own salons. Request more information from Taylor Andrews today to learn more about our programs.